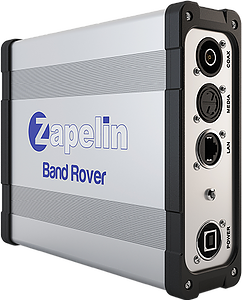 * In order to inject Streams in DVB Coax Networks it is necessary to purchase a Micro ZMS (IPTV to DVB-T) Digital Headend by Zapelin. Before your Output Stream is generated, you will be able to add a background safety layer to keep your stream alive as well as an optional surface layer that will allow you to insert advertising/information banners as an overlay! The banners are "fused" into the stream so Ad Blockers cannot remove them. Rent a CPU/GPU power with our Transcoding Engine. Feed the cloud with your source and generate outputs that can be embedded on a website, shared with other Zapelin Cloud users, shared over social networks or even use it to feed the Cloud Mux for the Micro ZMS. With our Multilayered Streaming technology, you will be able to set a Background image (visible if stream source fails) as well as a 3rd layer which can be used to display info/advertising banners - fused into the stream itself. Rent a Muxing Engine for injecting Streams in DVB-T Coax Networks. This can be populated with the streams generated by the Transcoding Engine or Streams shared with you by other Zapelin Cloud users. Configure Band, Frequency, SID and LCN and your Cloud Mux is ready to deliver the selected streams to the Micro ZMS which will inject the streams throughout the DVB-T Coaxial Network. The Micro ZMS takes the Streams you have generated with the Muxing Enginge and creates a with just 1 MUX that can be “injected” into an existing Coaxial Network.DVB-T or even ISDB-T output with just 1 MUX that can be “injected” into an existing Coaxial Network. As the generated MUX contains about 25Mbit, it is possible to fill the MUX with aproximately 20 streams @1Mbits or 10 HD Streams @2Mbit - It is up to you how you configure it. Thanks to the Micro ZMS, the TV’s on the Coaxial Network simply need to be “re-tuned” to detect the new IPTV channels that are being injected. The Micro ZMS has a single BCN connector. It is simply necessary to connect a Coaxial Cable from the Micro ZMS to the Headends of the Hotel/Community/Ship. Zapelin Media was the winner of the PREMIOS EMPRENDEDOR XXI award in 2016. The 10th edition of the Awards was organised by Caixa Bank with the collaboration of the Ministry of Industry, Tourism & Energy through ENISA.